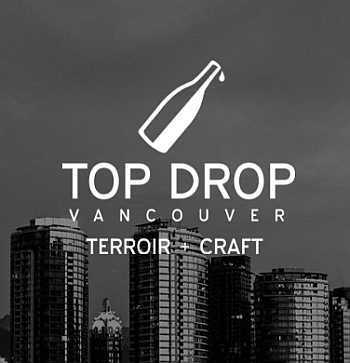 Top Drop is the last major wine tasting in Vancouver before the start of summer. Top Drop is meant to represent the best in terroir and winemaker craft. Nature and Nurture. Wineries from around the world are selected for the best of both, and we were not disappointed. In my 5 star wine rating, most wines were at least 4 stars. Below are my 4.5 star and 5 star rated wines from this event. Although you will not see any BC wines in this list, this does not mean that there were not any deserving BC wineries in attendance. I have several occasions to try BC VQA wines during the year, so I did not visit them at this event. Tantalus Vineyards, TH Wines, Meyer Family Vineyards, Clos du Soleil, Blue Mountain Vineyard and Cellars, and Bella Wines were all in attendance and I recommend their wines. When I look at my list below it looks like French white wines really impressed me, especially Champagne, and Italian red wines, especially Barolo. It is quite an extensive list. Enjoy! 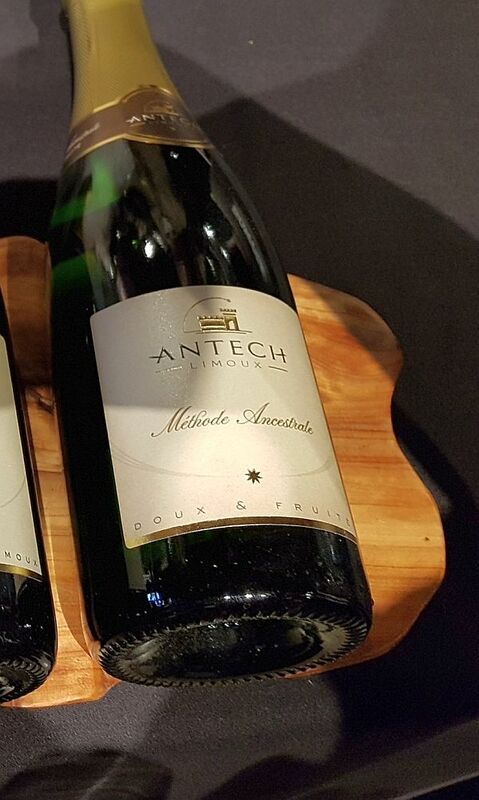 Antech Blanquette de Limoux, Method Ancestale, Limoux, France – This sparkling wine has a very light apple nose. Off-dry with small bubble and crab apple flavour. Salty minerality later. Blackbird Vineyards Aerena Rosé 2017, Napa Valley, California – This wine has ripe raspberry and raspberry leaf aromas, with more on the palate. Dry, round, with medium acidity. Mineral. A hint of oak. Yum. 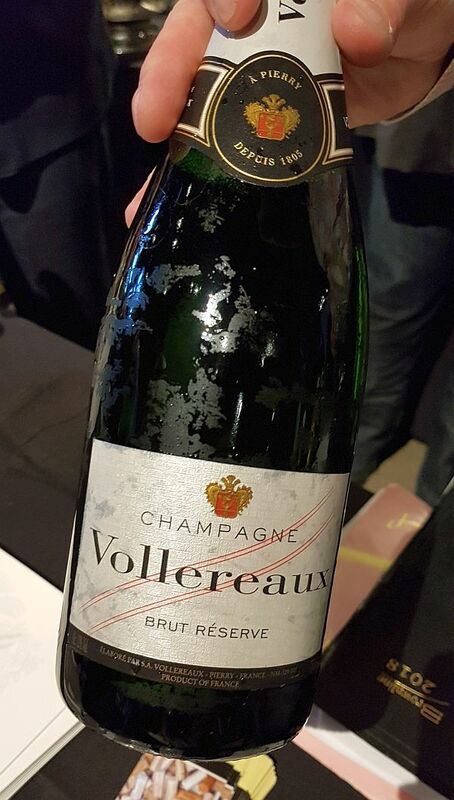 Champagne Vollereaux Blanc de Blancs Brut, NV, Pierry, France – Toasty apple nose. Dry with high acidity. Mineral, crisp apple and citrus on the palate. My favourite wine of the event! Champagne Vollereaux Cuvee Marguerite Brut 2008, Pierry, France – Light, toasty peach nose. More peach on the palate. The flavour explodes in your mouth. You get apple later on. Dry with small, mineral bubbles. Domaine Gerard Tremblay Chablis 2016, Chablis, France – Light apple on the nose. Medium plus body, round with medium acidity. Light flavours of nutmeg and stone fruit up front, followed by apple. Tasty. 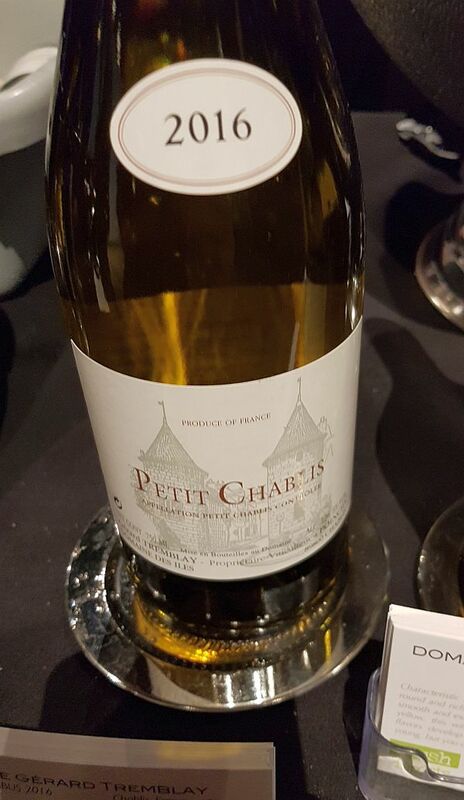 Domaine Gerard Tremblay Petit Chablis 2016, Chablis, France – A light citrus nose. Dry and smooth, with medium acidity. Apple, baked apple, apple seed, and peach flavours on the palate. G.D. Vajra Baudana Langhe Bianco “Dragon” 2017, Barolo, Italy – This white blend is primarily Chardonnay with lesser amounts of Sauvignon Blanc, Riesling and Nascetta grapes. It has a light stone fruit nose. Lighter body, off-dry, with medium acidity that leaves a light prickle on your tongue. Stone fruit and orange flavours up front to which honey and green fruits come in later. Antonelli San Marco Montefalco Sagrantino ‘Chiusa di Pannone’ 2010, Umbria, Italy – Made from the Sagrantino grape, it is said that this grape is good competition to Nebbiolo. This wine has a nice red fruit nose. Medium plus body with firm tannins. Red fruits, red cherries and light vanilla flavour. Barolo level tannins. This wine can easily age for another 8-10 years. Borgogno Barolo Classico 2013, Barolo, Italy – Red fruit and pine needles on the nose. Dry, medium body with more red fruit and pine needles on the palate. Interesting. Borgogno ‘No Name’ 2013, Barolo, Italy – An interesting story behind this wine, but too long for here. Nice sweet red fruits and vanilla aromas. Medium bodied, dry with medium acidity. Red fruit flavours. A harmonious wine. 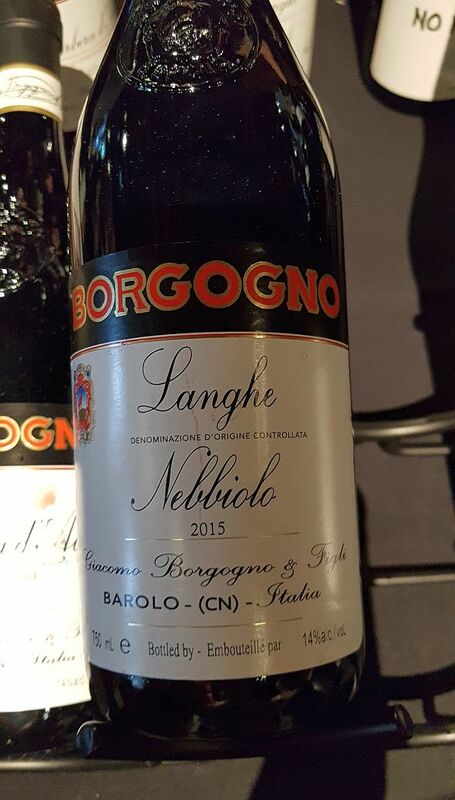 Borgogno Langhe Nebbiolo 2015, Barolo, Italy – Light red cherry nose. Dry, medium body and some roundness to it. Red cherries and light oak flavour. Firmer tannins but not overpowering. Nice. 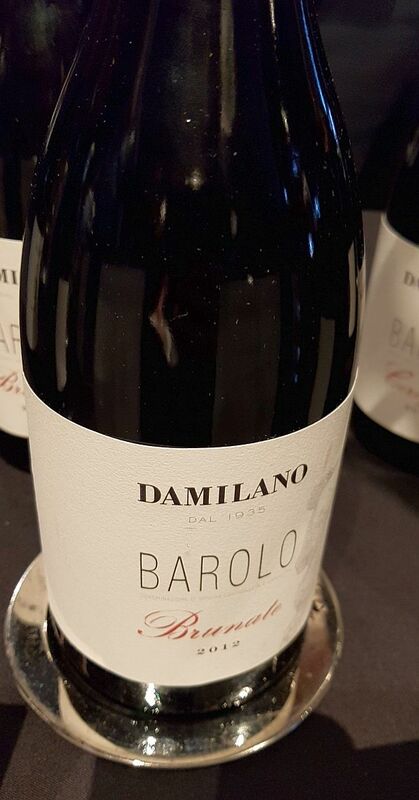 Damilano Barolo Cerequio 2011, Piedmont, Italy – Nice light red fruit nose. Medium body with a light mouthfeel but firm tannins. Red fruit flavours. A pretty wine. Damilano Barolo Cannubi 2012, Piedmont, Italy – Light earthy, red fruit nose. Medium plus body, medium acidity, and firm tannins. Red fruit flavours. Quality. Damilano Barolo Brunate 2012, Piedmont, Italy – Old world oak/cedar aroma with more on the palate. Medium body and firm tannins. Red fruit and tart red cherry flavours. Nice. Mathieu et Camille Lapierre Morgon 2017, Beaujolais, France – Very floral violet aromas along with sweet red fruits. Medium minus body with a light mouthfeel and medium tannins. Floral and raspberry flavours. Pretty. 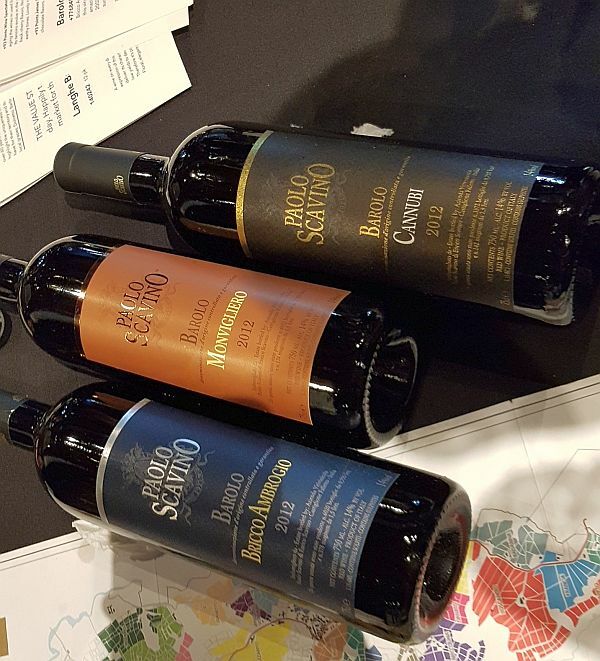 Paolo Scavino Barolo Cannubi 2012, Barolo, Italy – Nice red apple and red fruit on the nose. Silky mouthfeel with firm tannins. Red fruit and apples on the palate. Nice. Paolo Scavino Barolo Monvigliero 2012, Barolo, Italy – Very light red cherry aroma. Dry with medium acidity and firm tannins. Light intensity roses and red cherry flavours. 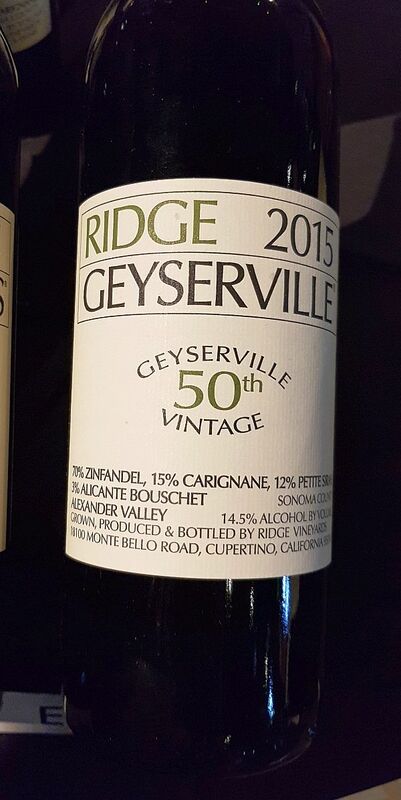 Ridge Vineyards Ridge Geyserville 2015, Sonoma County, California – A field blend, mainly Zinfandel, but also has Carignane, Petite Sirah and Alicante Bouschet. It has a nice ripe raspberry nose, together with some vanilla. Dry, medium plus body with a medium mouthfeel. Ripe red fruits and red apple flavours. Medium plus tannins. Tasty. Ridge Vineyards Ridge Pagani Ranch Zinfandel 2015, Sonoma County, California – Ripe, jammy, red fruit, raisins and figs on the nose. More figs and red fruits on the palate. Medium plus body, dry and semi-round. Medium tannins. A bit of residual sugar in this wine. Spottswoode Estate Vineyard and Winery Lyndenhurst Napa Valley Cabernet Sauvignon 2014, Napa Valley, California – Cassis with a hint of capsicum aromas in the glass. Dry, medium plus body and smooth, soft mouthfeel. Nice red fruit flavours and fine tannins. Very good. Yalumba The Scribbler Cabernet Sauvignon Shiraz 2014, Barossa Valley, Australia – Nice nose with aromas of ripe red fruits. Smooth mouthfeel with mineral, red fruits and cassis on the palate, and a hint of sweet spice. Sweet fruit toward the finish. 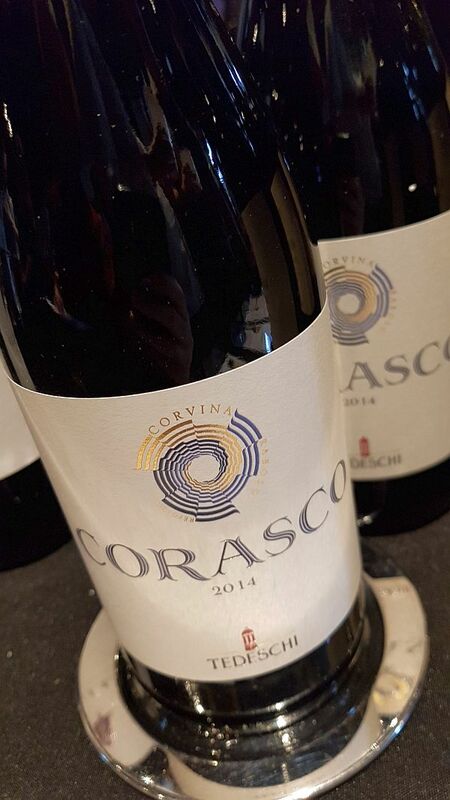 Tedeschi Corasco Appassimento Breve IGT 2014, Veneto, Italy – Coffee, meaty, dark fruit nose. Fuller body, dry with a mineral streak. Red fruits and sweet spices on the palate. Tedeschi Amarone della Valpolicella Classico, Veneto, Italy – This wine has earthy, dark fruit aromas. Fuller body with ripe and round black fruit flavours. Medium acidity and firmer tannins. Tasty.